Quick Facts: Like the Keese, the Ache is a bat that likes dark places. Red ones transform into Achemen, and violet ones disguise themselves as normal women. Attack Pattern: Aches tend to swoop down from the ceiling towards Link. This species of bat lives in dark places, like caves, forests, and palaces. They can usually be found hanging upside down from trees or cave walls. When approached, they swoop down at their target and back up again, repeating this attack until the threat has disappeared. Sometimes Aches swoop away from their target, sometimes toward. It is impossible to tell which attack the Ache will perform, but it usually repeats the same thing attack. Unlike the closely related Keese, some Aches have the ability to transform. (While a Vire will split into two Keeses when defeated, two Keeses have not been known to combine to form a Vire. Some Aches, on the other hand, have the power to transform into any form by themselves.) Red Aches will fly to the ground and transform into what is known as an Acheman. The Acheman is a red, batlike devil, similar to a Vire, that throws fire at its enemy. Other Aches have been known to disguise themselves as normal Hyrulian citizens, and walk the streets of crowded villages. If cornered, they revert back into Ache form and perform their standard attack. 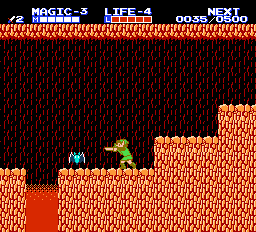 For example, the water town of Saria is infiltrated with violet-colored Aches disguised as normal women. When spoken to, they will claim to know nothing, and then revert to their original form. It is unclear why the Aches would do this; perhaps they are spying for Ganon. This seems to be collaborated by the statement of a man standing by Saria (Town)'s entrance: "Eyes of Ganon are everywhere. Be careful." Not all Aches are bad. A red Ache lives in a house in Nabooru, presumably as a tame pet, or perhaps as an equal to the house's owner. It can be found sleeping close to the roof. If bothered enough times, it will tell you how to find a heart piece. "A bat that lives in dark places. Usually, it hangs upside down from trees or in caves." Ache's original name in the Japanese manual is "ĒKU", which is simply a transliteration of the word "Ache" into katakana. This page was last modified on 2 March 2006, at 14:35.